This three-level dungeon – well, two dungeon levels plus one ground level, to be precise – anyway, this dungeon was a sudden side project I did. The idea was to experiment with kind of map “triptychs”. The idea is that I would start making maps with three levels, locations, etc. Then you could mix and match different parts from different maps. Take an old mine from one, caverns from another and a weird forest from a third one, for example. This map was the first one in this series and in future I will try to make the levels/locations/parts of the maps more separate, so that you can for example print the map and cut out the part you would like to use. When I started to draw this map I wanted to make three quite different levels or locations and riff of the idea of one of my earlier maps where a spacecraft was buried in ice. I wanted to make a ruined temple of sorts, which would be actually a wreck of a spacecraft turned into a temple. 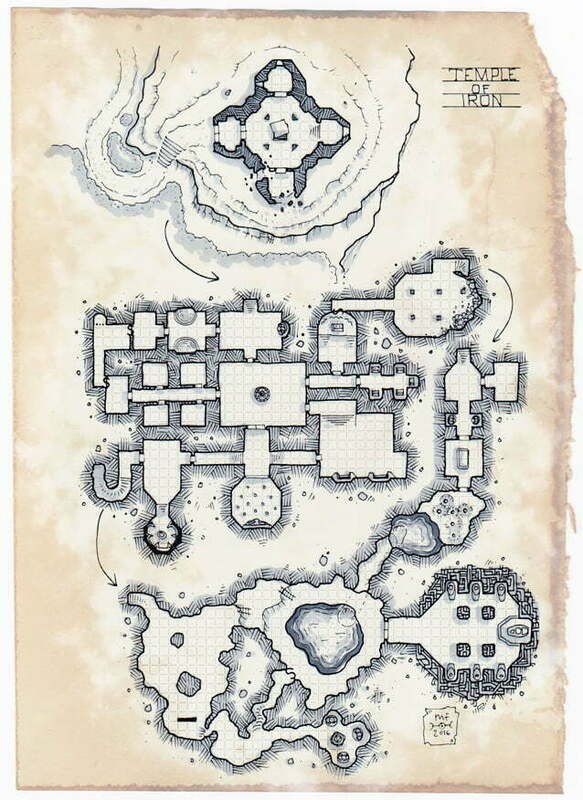 Now this temple has been abandoned, but there are cold and dark catacombs and dungeons built beneath it.